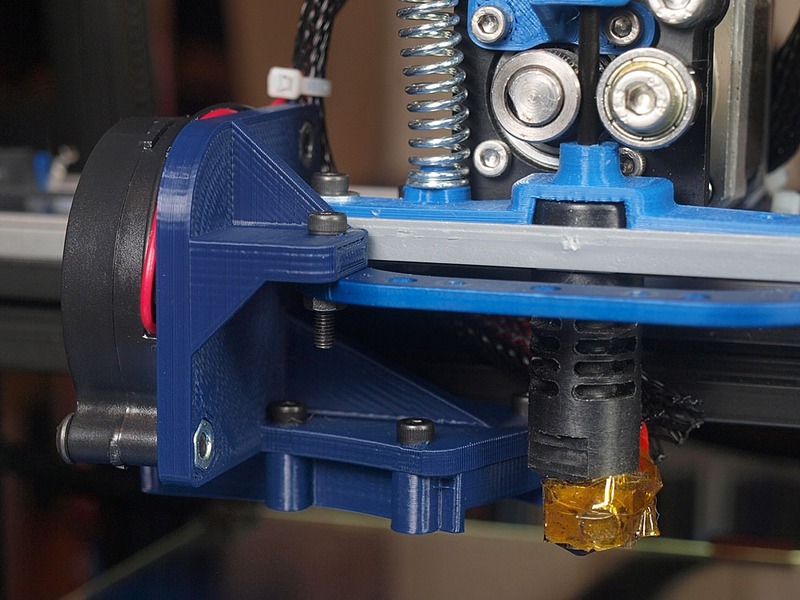 You need lots of cooling air when printing with PLA in order to keep the plastic from moving around and deforming. I have a MendelMax 2.0 printer, as well as a Makerbot Replicator 2 (which I won). At first I wasn’t that excited about the Makerbot because I had heard about how it wasn’t a good design and had problems. Until, that is, I tried it. The Makerbot nearly always produced better prints than my MendelMax. The Makerbot produces better prints in two ways: it has no Z artifacts that I can see, and it is amazing at handling overhangs and small features. It was a while before I realized that the secret to the overhangs was the choice of fan on the Makerbot. Unlike almost all FFF 3D printers on the market, the Makerbot doesn’t use a standard 40mm case fan. Instead, it uses a 50mm blower fan (more on this later). The MendelMax came with a single 40mm fan that mounted to the front. I was actually pretty happy with this fan at first. But then I found some designs were harder to print, and I read about Ohmeye’s use of two 40mm fans to increase the airflow. I was very happy with this design until my experience with a Makerbot Replicator 2 that I won in September 2013--it did a much better job ad made me realize there was much more room for improvement with my MendelMax 2.0. Since then I’ve been working on improving my MM 2. The opening at the end of the duct is larger than I wanted. I wasn’t sure why the smaller slot didn’t work well, and then I noticed air was being blown back out of the fan around the outer ring. In other words, when I placed my hand near the fan (to the left of the fan in this picture), I could feel quite a bit of air hitting my hand. That meant more air was being blown back out than was going through the nozzle. In other words, yes, good cooling really makes a difference, especially with the overhang in this design. At this point I probably could have stopped. However I took a better look at the Replicator 2 and discovered they used a completely different type of fan. The fan they used is a centrifugal fan (also know as a blower fan or squirrel cage fan) instead of an axial fan. These fans seem to be much better at pressurizing the air, and therefore can provide a faster flow of air over the nozzle. This is a 24 V fan since the MendelMax uses 24 V for the heaters and fan. I designed a new fan duct to use the centrifugal fan, and I decided to if this single ducted fan would be as effective as my two fans (with one being ducted). It was.